When the Mardukite Chamberlains began ‘banding’ together a contemporary vision of the original ‘Egypto-Babylonian’ or “Mardukite” lore, there was only one other volume (and a well known book) that might be remotely correlated to the effort, at least from the perspective of modern practice and how it could be relayed to the esoteric sects of society – and that was the “Simon” Necronomicon. But… “Simon’s” work is very liberally ‘bastardized’ from what the Mardukite Chamberlains would later find to be a more “more complete” renderings of a ‘similar’ tradition that directed under the authority of the Priests of Nabu in ancient Babylon and even Egypt. 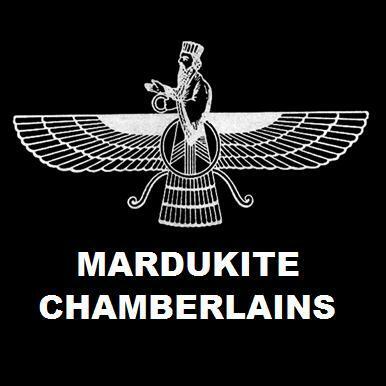 If there is, indeed, an occult or ‘practical magick’ element to be gleaned at from the Mardukite work, its emphasis would be the global origins of such systems, the mystical traditions that were born in prehistoric Eridu (near the Persian Gulf) by ENKI, with MARDUK as the assistant — the first priest of Eridu during the pre-Babylonian (Sumerian) age. The system of ‘magick’ emerging from Eridu was later synthesized and systematized in Babylon under the name (or names) of MARDUK, with NABU assisting by that time (in Babylon) as the active scribe-priest and magician — the first high-priest of Babylon during the post-Sumerian age and active leader of the original ancient “Mardukite” paradigm! The Evolution of a Tradition… Since the Babylonian age, humanity’s tendency toward ‘system-fracture’ and ‘fragmentation’ simply evolved and developed further – seemingly separated by semantics, space an time – but still using the same basic archetypes. On February 28, 2019, the world witnesses a global release of a completely revised and rewritten hardcover anthology of the Mardukite GATES OF THE NECRONOMICON cycle of materials by Joshua Free, the developer of the original revival of the “Anunnaki Bible” as NECRONOMICON: THE ANUNNAKI BIBLE–also available in this very special commemorative hardcover 10th Anniversary Collector’s Edition series! Whether you choose to read the new edition of GATES OF THE NECRONOMICON -or- THE SUMERIAN LEGACY, Joshua Free, world renown esoteric expert and Director of the modern “Mardukite Research Organization,” invites YOU on an incredible progressive journey to illuminate the most ancient and inaccessible facets of human history, spirituality and religious tradition on the planet. The “Mardukite Core” Year-2 cycle originally appeared across four different discourses — released separately as Liber 50, Liber 51/52, Liber R and Liber 555 — and now you have this amazing opportunity to access the newly revised and rewritten materials for the commemorative 10th Anniversary editions: GATES OF THE NECRONOMICON (Liber 50,51/52,R-555) and THE SUMERIAN LEGACY (Liber 50+51/52) — the perfect companion to the original “Mardukite Core” Year-1 anthology, NECRONOMICON: THE ANUNNAKI BIBLE (Liber N,L.G.9,M/W+S). THE GATE OPENS ON FEBRUARY 28, 2019. “Seven key thresholds are encountered when the practitioner is ‘rising on the planes’ of the ‘Ladder of Lights’ in ancient Babylonian tradition. But to be sure, while early Mardukite Chamberlains determined that seals of these Star-Gates given within Simon’s interpretation have proven effective, they appear to have been added later in the tradition and do not match the simplicity of those found in ancient and historical Mesopotamian systems.” —Joshua Free explains in the 10th Anniversary hardcover collector’s edition of the original source book of the modern “Mardukite” tradition— NECRONOMICON : THE ANUNNAKI BIBLE. While pragmatic ceremonialists can certainly benefit from inscribing signs in the ground (or on boards and banners), it should be understood that these acts are performed in addition to the constructive visualization and “astral” work conducted and not as replacements for these non-material efforts. An important key to remember when dealing with the nature of the ANUNNAKI dimensions is that our world is really encompassed by one singular and unifying dimension of ALL (or All-as-One) equated to (equal and one with) the Divine Spark of the Eternal Source—however… the mind-body system has been fashioned with several shells or layers that are perceived as separate based on the perspective of the Ego, which is programmed to separate all things into parts beginning with the I-not-I monad (mundanely: what I am versus what I am not). — Le Nécronomicon du Nouveau Millénaire: Le Grimoire Égypto-Babylonien — Mardukite Liber N French Edition! — MARDUKITE NECRONOMICON — “Real” ANUNNAKI BIBLE is Origins of Everything! Even Judeo-Christian Scriptures! Joshua Free—Director of the modern Mardukite Research Organization—returns to YouTube for a “Mardukite TV” 10th Anniversary Reboot! This new series is dedicated to exploring the work of a New Thought movement known in public as the Mardukites. —available on October 30 this year, for the first time in a mainstream release as a 10th Anniversary Collector’s Edition Hardcover containing the complete Mardukite tablet library archives as originally developed during our first active year in 2009. All of these amazing materials are found within the pages of the amazing source book developed by Joshua Free for the modern Mardukite movement — “NECRONOMICON: THE ANUNNAKI BIBLE” available to the public for the first time as 10th Anniversary Collector’s Edition Hardcover!